The ever-helpful we show you how to apply chord tone ideas to a funky backing track… The are some fiddly moments towards the end of the piece, but the basic principle of supplementing your pentatonic vocabulary with chord-tone ideas is one you should be able to put into practice pretty much straight away. 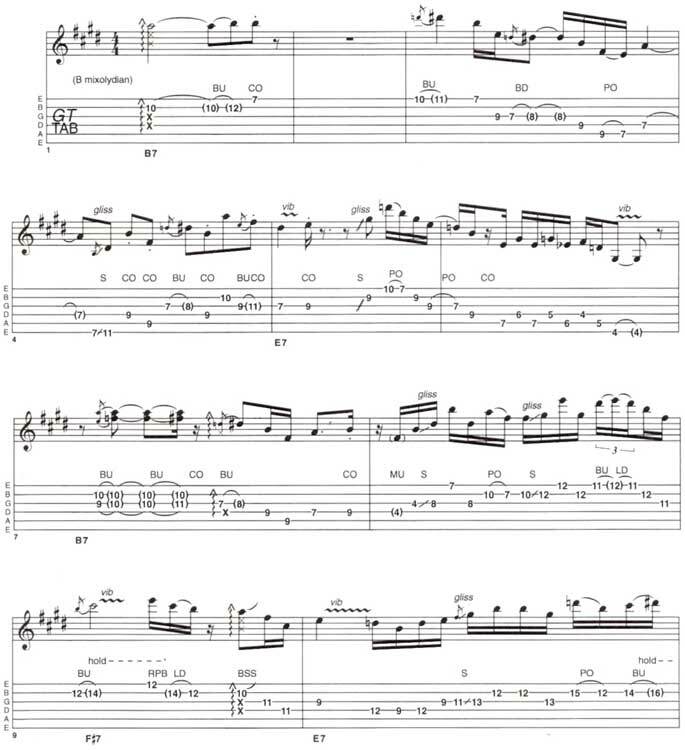 The word arpeggio is most commonly defined as a ‘broken chord': the effect you get when your fretting hand holds down a chord shape and your picking hand strikes each note individually for that ‘House of the Rising Sun’ texture. If you speed things up and dampen each string as you strike the next, you get a ‘sweep arpeggio’ -the bubbling sound you hear on Yngwie Malmsteen albums from time to time (and on Frank Gambale albums most of the time!). This time, however, we’re going to be using arpeggios in a slightly less regimented way, with more emphasis placed on how to improvise with them and know what you’re doing. I’ve chosen dominant 7th chords as our testing ground because they’re so common in western harmony and yet many players seem unsure about how to play over them, relying on a default repertoire of minor pentatonics which don’t entirely complement the sound of the dominant chord. Before we go any further, let’s clear up any potential theory problems: a dominant 7th chord is the ‘normal’ 7th chord we all recognise from such open chord shapes as E7, A7 and D7. It has a slightly tense sound, as if it wants to resolve to another chord five frets higher up, but should never be confused with a major 7th chord (such as Emaj7), which has a sweeter sound and is often used in film soundtracks to suggest that love is in the air (or possibly to irritate Allan Holdsworth, who apparently detests the sound of major 7th chords on account of their inherently twee, saccharine quality!). The formula for a dominant 7th chord is 1, 3, 5, b7. In effect, this means you have the root (which gives the key of the arpeggio), the third four frets higher (which gives a happy major-type sound), then up three more frets to the fifth (which thickens out the root note) and, finally, the flat 7th, three frets higher again, which gives the ‘dominant’ sound (tempering the happy sound of the third with a certain tension). These matters are always a little subjective, but I think that the root and 5th are the obvious-sounding notes in a dominant chord, while the third and b7 are the interesting notes which give it its distinctive character. You might like to note that the gap between the third and the b7 is a tri-tone (or three whole tones) – that’s the discordant Devil-summoning interval you hear at the beginning of ‘Purple Haze’ – so there’s an evil-sounding clash lurking in there should you wish to emphasise it. If you consult the accompanying fretboard diagrams, you’ll see that these notes are mapped out over the entire neck. Try picking a chunk of fretboard (say, frets 7-11) and memorising the notes for each of the three arpeggios within that position. Then try playing over the backing track using only these notes, but feel free to jumble them up into any order you like. After a little experimentation, I think that your ear starts to pick up on things like, ‘if I play a D# over the B7 chord, I can move it down a semitone when the E7 comes, and it sounds good because the melody I’m playing hasn’t jumped a huge interval even though the chords in the backing track have’. Obviously, you wouldn’t congratulate yourself in as many words mid-solo, but you will find that your awareness of chord-tones (or arpeggio notes) increasing. The more second-nature this stuff becomes, the more fun you can have with it! If you’re already comfortable with all this but get the same effect that you hear on the audio track, don’t worry – I’ve taken some liberties with the notes, mainly in the form of bending up to the third from one fret below for a bluesier sound, or occasionally throwing in a jazzy-sounding 9th (two frets above the root) or a tenser-sounding fourth (just one fret above the third). If you want to add the fourth in, just remember not to end a phrase with it, the fact that it resides one semitone away from a ‘really good note’ can create an almost painful-sounding tension. Try it and hear what I mean! There’s a touch of Richie Kotzen about the vibe on the audio track, but everyone from Albert Lee to Larry Carlton has used a dominant arpeggio approach over a 7th chord at some point or another! © 2012 - 2019 TabsClub Powered by TabsClub 42 queries in 0.265 seconds.